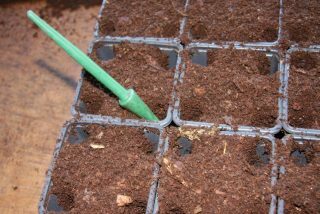 February is the time for the first batch of sowing. The earliest plants to be grown in our greenhouses are capsicums, tomatoes and sweet peas. As a germination medium, we use a mixture of three parts coir (ground coconut fibres), two parts all-purpose compost and one part bark. The intention is to create a loose and free draining medium which is low in nutrients to avoid scorching of the newly germinated seedlings. 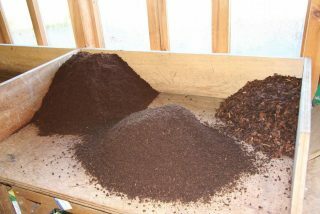 To further increase the free drainage, the coir and compost are sieved before the three components are mixed together. Components of 3:2:1 germination medium. Depending on the seed size, we use two different procedures: Small seeds up to 3 mm in diameter, such as peppers, are sown in seed trays. 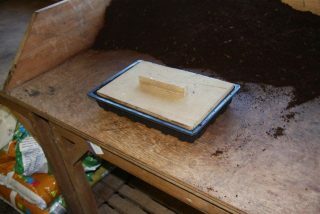 The trays are first filled with the germination medium which is then levelled and compacted using a board to remove air pockets. 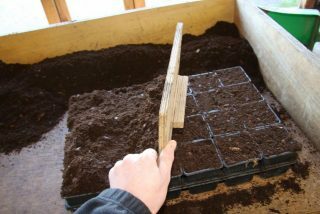 Levelling and compacting of growing medium in seed tray. 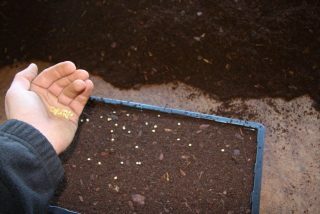 Next, the seeds are scattered evenly on the surface and then covered with a mulch of fine grit to create a stable environment with respect to moisture and temperature. 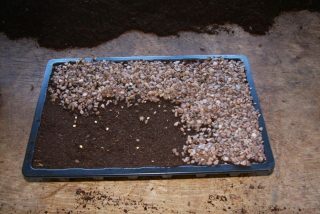 Scattering and covering small seeds in seed tray. A label with the plant name and sowing date is inserted, the tray is then gently watered with a fine rose and, finally, placed on a heated propagation bench (18 °C). Large seeds, such as sweet peas, are sown in 9 cm pots (don’t forget to soak sweet peas overnight before sowing!). As before, the pots are filled with growing medium which is then levelled. 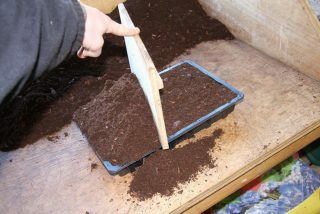 Using a dibber, one seed is placed in each corner. Instead of grit, a thin layer of growing medium is used to cover the surface. To remove air pockets, the pots are gently dropped (from a height of no more than 5 cm!) onto the potting bench before being watered and placed on the propagation bench. Levelling of growing medium in pots and placement of seeds.